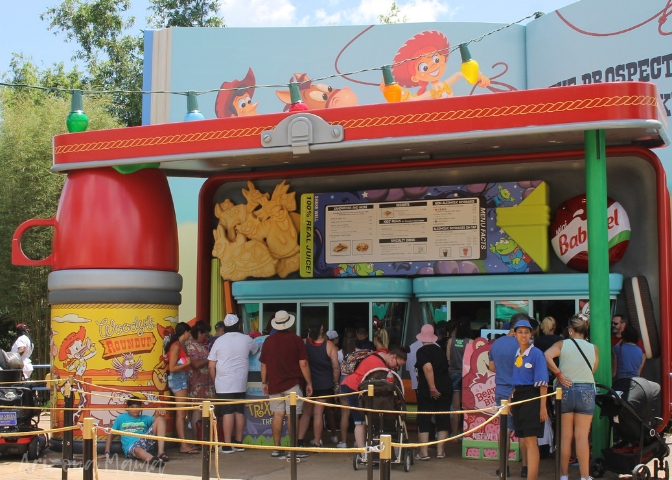 Guests can now visit Andy’s backyard at Toy Story Land in Disney’s Hollywood Studios. Check out our tips on the experience, rides and food! The theme, of course, is movies and they do a fantastic job representing so many favorite films and music. 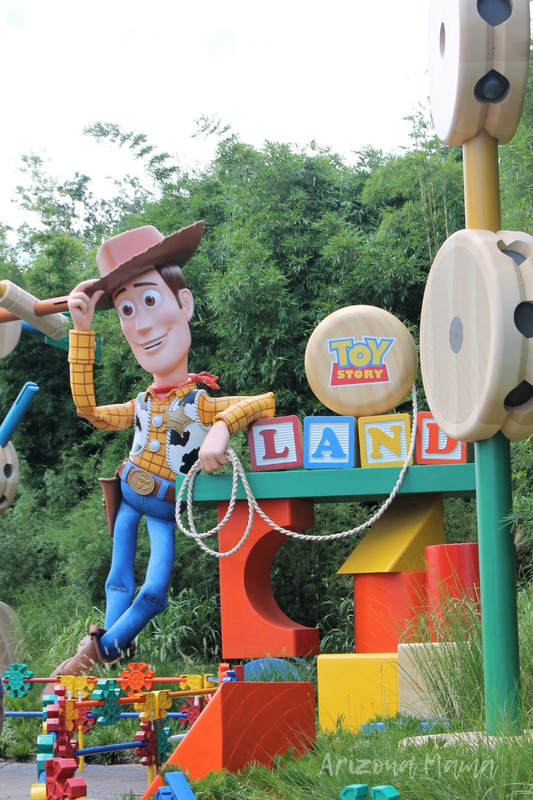 Toy Story Land is the newest area to open there, just this past summer, and it was well worth the wait. They previously had a section of Pixar & Toy Story, but it wasn’t very large in size. It always felt very tight to walk through, even though the detailing in it was so fun. Our family typically would go to ride the Toy Story Mania ride and then split, because it was always super crowded and hectic to move through. If you have previously visited that area, I’m sure you can relate. You may remember the way it was set up, with the scrabble letter signs, and the Army men here and there. They had the cute Barrel of Monkeys hanging over the walkways in front of the Mania ride. It made us feel like we were “part” of the toys. Now, the ride is still in the same place, but the way you enter the new Toy Story Land is from the opposite side and they have that entrance part closed off. It does appear that they will be changing it up a bit, so it is possible that eventually you will be able to go through from that side as well, but since they are building the new Star Wars Land right next to this, it may just be remodeled to be something that goes with that instead. So, the Toy Story Mania ride still is the same ride, with a new entrance that is mega-cute, and some new additions to the line like giant Uno cards and more army men scattered throughout the queue and outside areas. Mainly, the inside line queue is the same, it only changed a bit at the beginning and at the exit. It is such a classic and fun ride for the whole family that I am so glad they kept it in tact. 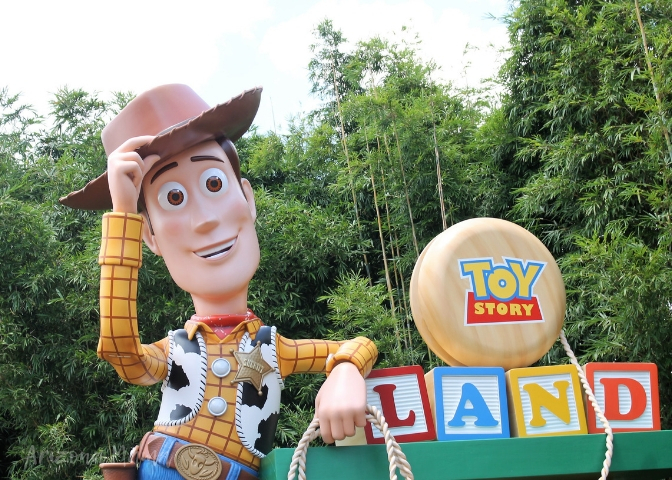 The NEW Toy Story Land has 2 brand new rides plus an eatery added and the decorations are so fun. As you enter, you come up on a giant Woody and great fencing that is colorful and looks like it made of giant K’nex toys. 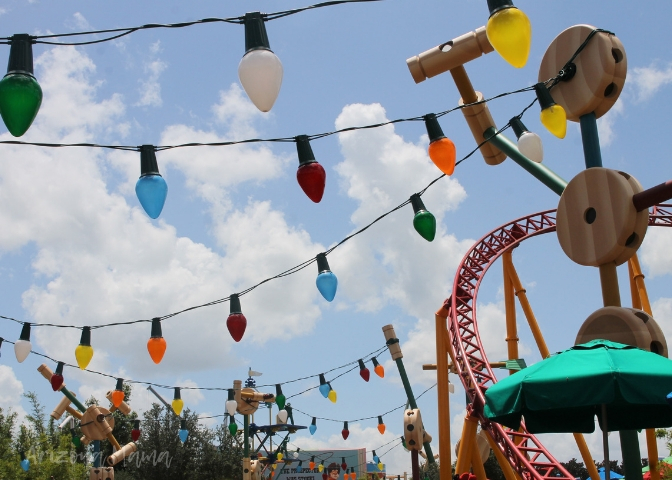 They have “strung” lights all over the entire Toy Story Land that decorate the area. The lights are kind of similar to the ones inside the Mania ride and they really give it a great, colorful vibe. At night they help light the way, too. There is a great picture taking spot by the entrance where Woody is. You may see a Disney photographer there as well, so if you use the photo pass service, check that out for sure. All of the buildings and décor are made giant sized, so that you feel like you are one of the toys yourself and to me, they knock this out of the park, in typical Disney fashion. 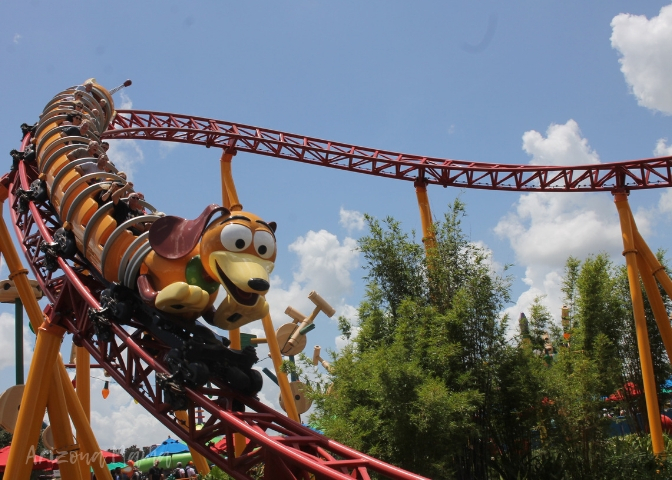 There is a new coaster, called the Slinky Dog Dash. It is a good sized one, for a Disney park, but it’s not overly fast. It is very cute and more like a middle-grade as far as the size and speed, so it is definitely more of a family type ride. The cars are part of Slinky Dog himself and there are great stacks of toys around like wooden blocks, Jessie and Rex. Since it’s rather new, the line may stay long for a while. If you can get a fast pass for this one, I would jump on it. This ride is the first thing you really come to as you enter the area, but the entrance to it is around the corner a bit. On your way there you‘ll see the Toy Story Mania ride as well. 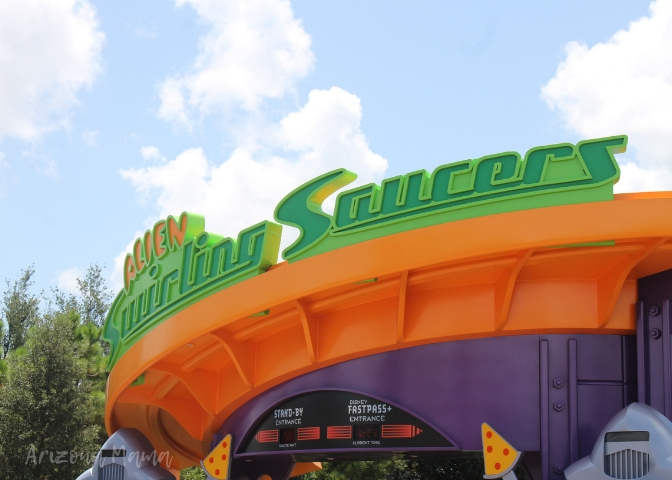 Just past the coaster on the back right of the Land is the other ride, the Alien Swirling Saucers. 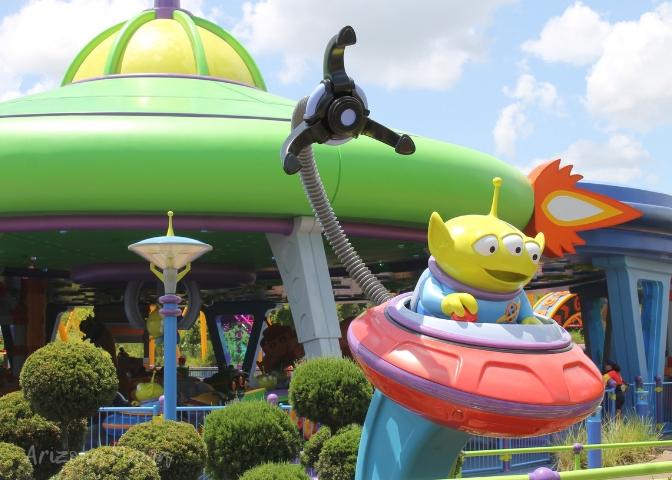 It is a spinning style ride (think Tea Cups) and it has is decorated with Buzz Lightyear and Aliens. This ride is so fun and cute, but does have height restrictions. You do have to be 32” tall to ride this one. If your child isn’t into spinning, I’d skip it, but it’s nothing too wild. After the aliens ride, look across the way. 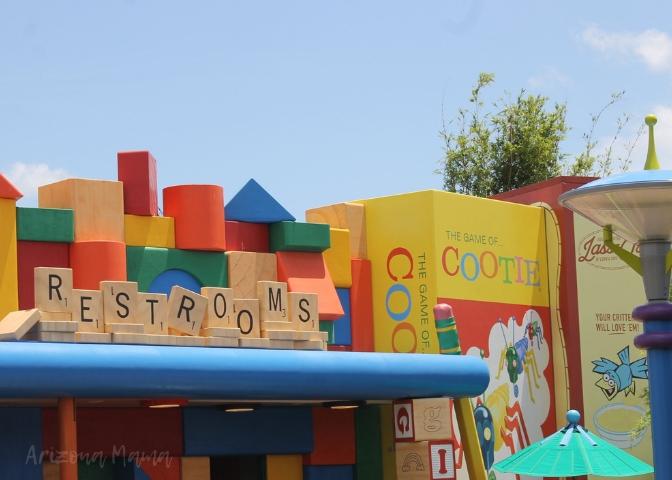 You’ll see the restrooms, which are so cute. They are decorated with “Cootie” bug toys, Scrabble letters and Tinkertoys. 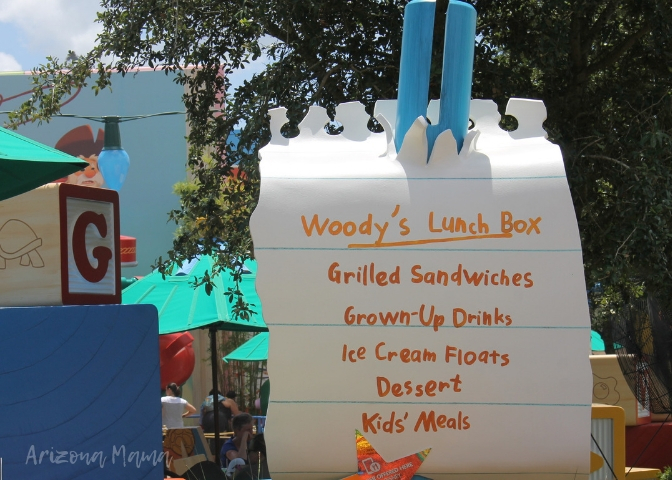 Then, working your way back up on the left towards the Mania ride and back out, you’ll find the Woody’s Lunchbox eatery. It is a walk-up style place to eat and it looks like a giant metal lunchbox. I was kind of enamored with this when I first saw it. So cute. It is a lower-priced place to eat too, perfect for big families. They have sweet treats, breakfast foods for entrees, sandwiches, cheeses and fun drinks. Even the menu signs look like they were written by a kid as you walk up. They have juice for the kids, but they also have coffees & some alcoholic beverages for the adults. Overall, I think you will love seeing this whole area. If you visit anytime soon, I would make it a point to go there first. If you have kids, you’ll be ahead of the crowds, which always helps. They do have a few areas with benches and umbrellas you can hang out under if needed. 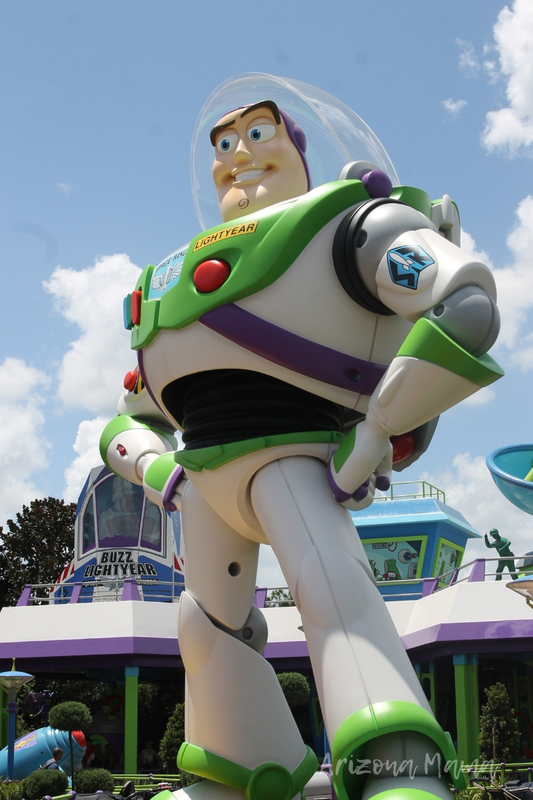 Woody and Jessie, plus Buzz Lightyear do stroll around frequently too, so have your cameras ready!